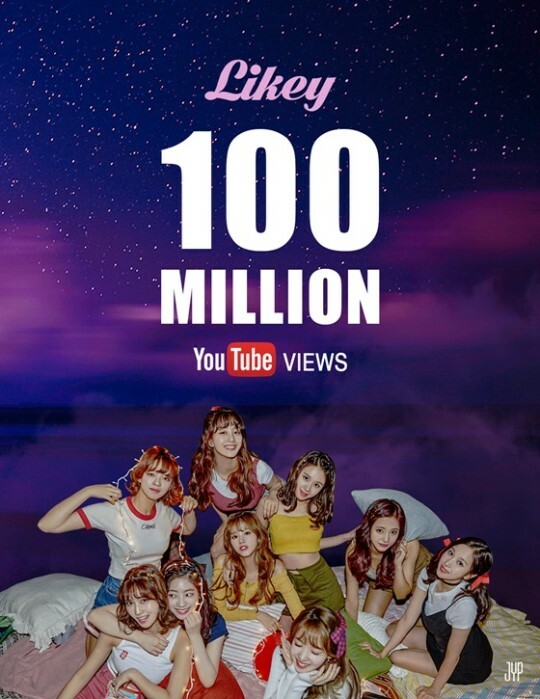 TWICE’s “Likey” reaches 100 million views on YouTube. According to the girl group’s agency, JYP Entertainment, the song passed the 100 million view mard at 5:43 pm KST. It took about 33 days, 23 hours, and 43 minutes for “Likey” to reach the landmark. With this achievement, TWICE’s “Likey” has become the fastest K-pop girl group video to reach 100 million views on YouTube. Furthermore, it also becomes the sixth music video from the girl group to reach 100 million views. As of this article, three music videos, “LIKE OHH-AHH”, “TT”, and “CHEER UP”, all have over 200 million views. “Likey” is the title track for TWICE’s first studio album Twicetagram that was released Oct. 30. Since its release, the song has won over 7 awards on various music shows such as “Inkigayo”. Moreover, TWICE performed the song at this year’s Mnet Asian Music Awards in Japan. This month TWICE will release a special repackaged holiday album, Merry & Happy, on December 11. According to JYP Entertainment, the album will include the new song, “Heart Shaker”, which is tailored for the holiday season.